According to Business Korea, LG Display is likely to start investing in its P10 10.5-Gen OLED TV fab in Paju by the end of the month (Q1 2019). Total investment in the P10 production fab is estimated to reach almost $10 billion. LGD was supposed to start ordering equipment for the P10 line towards the end of 2018, but the company delayed these plans - according to an earlier BK report, LGD delayed the P10 fab in late 2018 as it found the shift to new 10.5-Gen substrates more challenging than it earlier expected, and in addition it wanted to focus on its upcoming 8.5-Gen line in Guangzhou first. Apparently LGD is now ready to start building the P10 line. DSCC says that in 2018 OLED display equipment spending fell 7% compared to 2017 to reach $12.5 billion. In 2019, DSCC predicts that OLED spending will fall a further 59% as poor mobile OLED fab utilization is still low. Looking further in 2019, DSCC sees OLED spending to rebound by 111% to $10.9 billion (still quite lower than in 2017) but drop 40% again in 2021 - to only $6.2 billion. Israeli-based InZiv announced that it has successfully closed a Series A round, raising $2.5 million from Maverick Ventures Israel. Using proprietary technology, InZiv designs and manufactures inspection equipment based on highly specialized nano-scale optics and near-field microscopy. InZiv's equipment is specifically designed to test next-generation display - such as OLEDs, Micro-LEDs and QLEDs. InZiv says that its nano-optical and metrological inspection equipment offers the ability to study a wide variety of defects not detectable with existing tools. 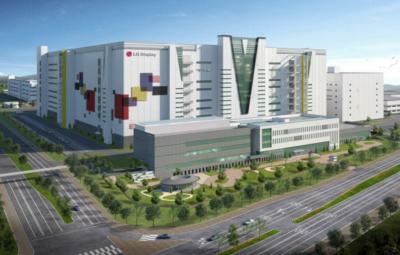 In July 2017, LG Display announced that it decided to build a 8.5-Gen (2200x2500) OLED TV production line in Guangzhou. Following many delays, LGD got the approval for its new OLED TV fab from both the Korean and Chinese governments only in July 2018. Korea ETNews now reports that LG Display started to install the production equipment in the Guangzhou fab. LG Display's new fab will have a capacity of 90,000 monthly 8.5-Gen substrates (2200x2500 mm), using two production lines. The equipment in the first line (with a capacity of 60,000 monthly substrates) was already installed, and LGD will soon (H1 2019) start ordering and installing the equipment in the second line as well. DSCC says that Q3 2018 was a record quarter for display equipment spending, as sales reached $7.8 billion billion in the quarter - up 13% from Q3 2017. In the quarter five new 6-Gen OLED lines were installed in addition to a 10.5-Gen LCD fab.The top 5 equipment vendors, according to DSCC, were Canon (13.1%), Applied materials (9.6%), Tokyo Electron, Nikon and SFA Engineering. Despite the record quarter, total display spending will fall 9% in 2018 (to $21.6 billion). 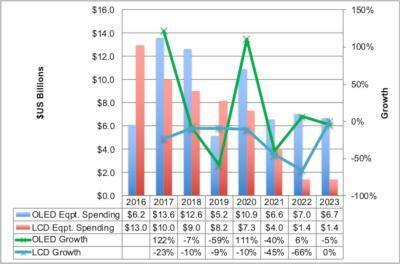 OLED equipment spending is expected to drop 44% in 2019 to $7 billion as mobile OLED spending slows. DSCC says that OLED spending will rebound in 2020, and will increase by 50% to reach $10.5 billion. 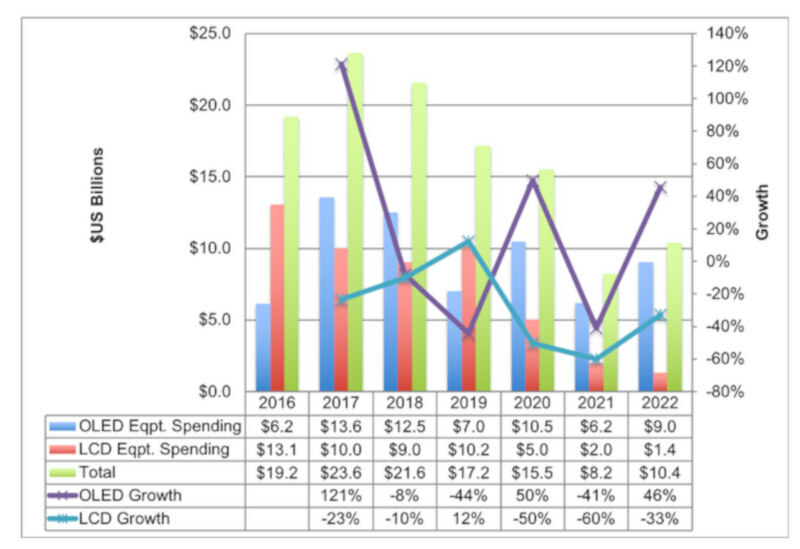 In 2021, DSCC sees OLED spending declining again, and then rebound in 2022. Japan-based printed OLED developer JOLED announced that it will demonstrate a 55" 4K printed OLED TV at Finetech Japan 2018 (December 5-7 2018). 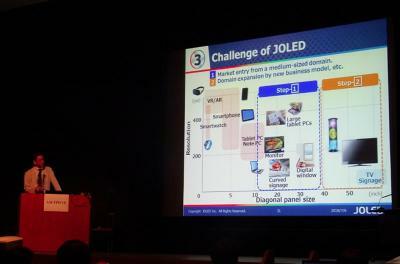 JOLED will also introduce its proprietary printed OLED manufacturing technology. A few weeks ago JOLED announced that it has signed an agreement to develop, manufacture, and sell printing equipment together with Panasonic and Screen Finetech. This is the first time JOLED will show a 55" OLED prototype (in July 2018 the company did include TVs in its future roadmap). JOLED tells us that it has no plans to produce large size OLEDs at this stage - and this TV is on display just to demonstrate JOLED's printing technology. Samsung Display is developing hybrid QD-OLED TV technology, and according to estimates, the company aims to begin trial production in 2019. It is also estimated that Samsung has several challenges to overcome, but according to new reports from Digitimes, Samsung is aiming to start installing equipment for the new fab as early as December 2018. The new fab will begin operation in the second half of 2019 - pilot production at first which will be expanded to full scale mass production. The new fab will be built in Samsung's L8 LCD production line in Asan, and will take over one of the two lines currently in operation at the fab. 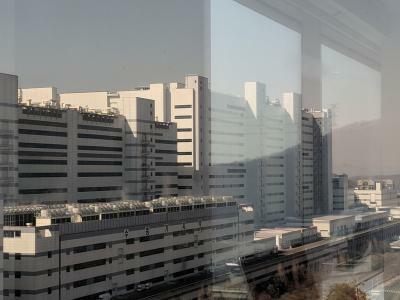 Samsung's initial production capacity will be around 25,000 monthly G8 substrates. 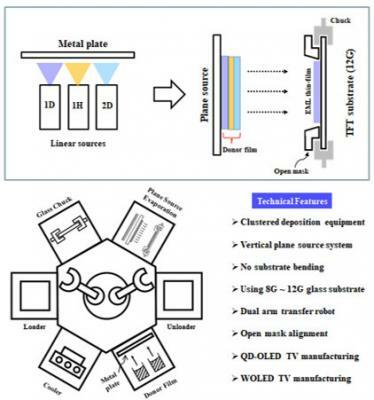 Korea-based OLEDON announced that it has developed a vertical-plane source deposition technology that can be used to produce both small-area and large-area OLED panels. 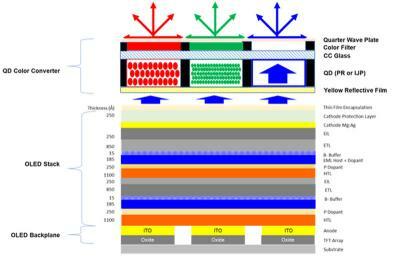 The company is now adapting this technology for ultra-large substrates - up to 12-Gen (3300x4000 mm) in size. OLEDON says that currently-used inline evaporation processes lower the yields for large-area production due to FMM sagging and difficult control of the multiple sources. The company's vertical plane source deposition may prove to be a viable alternative. 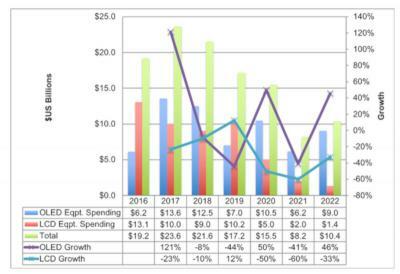 Display Supply Chain Consultants (DSCC) updated its display equipment spending forecasts, and the company now expects OLED spending to recover only in 2022. In June 2018, DSCC estimated that the OLED equipment market will start to recover in 2020. DSCC says that the whole display market is currently saturated after unprecedented equipment spending in 2016-2018 (an average of $22 billion per year for both LCDs and OLEDs) - for both mobile display and TV display production. Display production is expected to grow at 10% per year from 2018-2020 (as a result of the equipment orders in 2016-2018), and combined with lower operation margins and losses in the display market are causing display makers to be cautious with new capacity plans.